Most genealogy researchers are very familiar with the journals of genealogy societies: local, regional and national. An example of a local society journal is the ChicagoGenealogist, a publication of the Chicago Genealogical Society. The Western New York Genealogical SocietyJournal, published by said society , covers eight counties. A national organization, such as the NationalGenealogical Society, will have a national journal -- the National Genealogical Society Quarterly. Many genealogical journals, including the ones above, are classified as academic or scholarly journals. When a writer submits an article to an academic journal, he or she can expect to have the piece peer-reviewed. Because of the rigorous standards that writers in academic journals must adhere to, the quality of the research is very high. First, the scholarly article begins with an Abstract or summary of the research question: What is the reason for this study? What are the topics/questions being investigated? The fourth part of a journal article is the Methods and Data: What did the author find and how did he/she find it? The fifth section is Analysis and Results: What analytic techniques does the author use to tease out information from the data? How does the author interpret the findings? The final step in the reporting on research is the Discussion and Conclusion: How do the findings connect with other data? What other questions can be asked based on the new information? Has this research added any new knowledge to this topic that would be valuable to others? Many genealogical societies publish scholarly journals that contain information very helpful to family researchers. But academic journals in a variety of disciplines often contain articles of great interest to genealogists. Where might one look to find these publications? 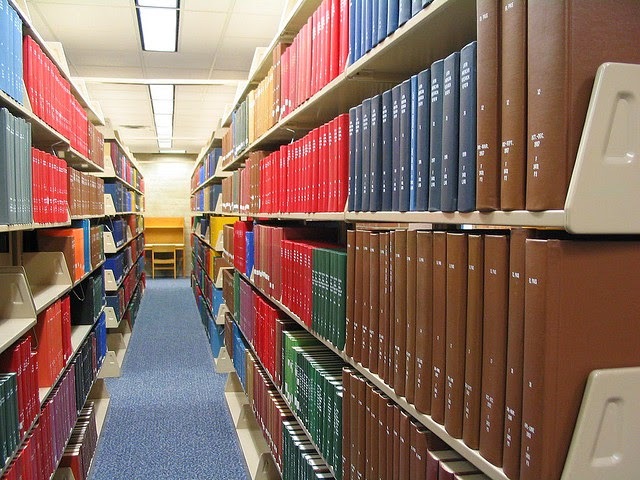 Scholarly journals have long resided in college and other libraries. But in this age of the internet, digital copies are now available for many journals. According to Wikipedia, in 1995 Princeton University led an effort to digitize ten journals at seven libraries in order to save storage space. The project was called JSTOR, “pronounced JAY-stor; short for Journal Storage.” Today JSTOR offers “more than 1900 journal titles” from over 900 publishers. On the menu bar at the top of the screen, hold the mouse on “For Publishers” to access a drop-down menu. This gives you an A-Z list of the more than 900 content providers whose journals are in the database. You can also find journals arranged by content area: Browse by Subject. Now that we know about JSTOR and its treasures, how can we access the journals? For faculty, staff and students of one of the 8,400 institutions that belong to JSTOR world-wide (including many colleges and universities, museums and public libraries), unlimited access is free. If you are an alumna or alumnus of one of these participating universities, you may also have free access. I was greatly pleased to see my alma mater, the University of Arizona, on the list! How about for un-affiliated individuals? JSTOR has two ways you can gain access: JPASS (costs and has some limits) and Register and Read (free but has limits.) JSTOR is also offering free access (some limits) to journals “published prior to 1923 in the United States and prior to 1870 elsewhere” through a program called Early Journal Content. Well, now that we know how to access journals at JSTOR and what kinds of journals we can expect to find, let’s look at the results of a search. One of my family lines is Irish, and they lived in Chicago from the 1850s. I want to learn as much about the lives of these people in the mid to late nineteenth century as I can. In JSTOR, I did a search on “Irish Chicago” and got over 2500 hits. Neighborhood Effects on the School Attendance of Irish Immigrants' Sons in Boston and Chicago in 1860 David W. Galenson American Journal of Education, Vol. 105, No. 3 (May, 1997), pp. 261-293. It is important to remember that although this article was not written for genealogists, it has great significance for anyone interested in American history: life in large cities in the nineteenth century with an emphasis on the lives of immigrants. Photographs Division Washington, D.C. 20540 USA. “In recent years social scientists have become increasingly interested in the question of how members of ethnic and racial minorities are injured economically by living in segregated neighborhoods. A central concern has been that the poverty of these neighborhoods may be self-perpetuating.” p. 261. “It was often expressed in the nineteenth century, with a particular focus on the problem of immigrant children who failed to attend school.” p. 261-262. The purpose of this study was to “investigate the concern of (George Emerson, prominent Boston educator) and others in the nineteenth century that the children of immigrants who lived in ethnic ghettos were less likely to attend school than their peers who lived elsewhere.” p. 262. Of great interest to genealogical researchers is the source Dr. Galenson used for his study: the 1860 Federal Census for Boston, MA and Chicago, IL. He looked at each of the wards in both Boston and Chicago and compared them by wealth and ethnicity – with a focus on Irish heads of household. Many of us have perused census documents, but it is unlikely that we have done anything like what Dr. Galenson did with the data. 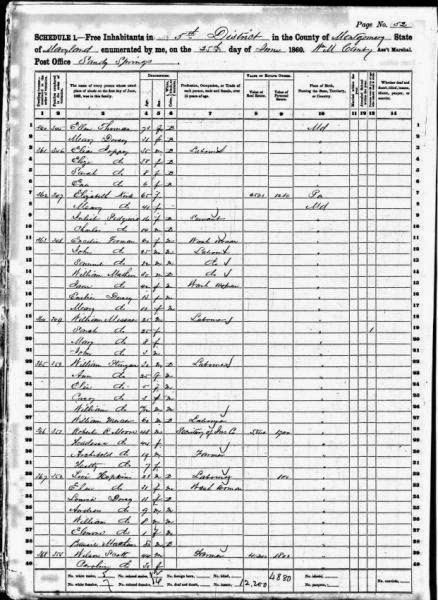 Among the information the 1860 Census asked for were the ages of the children living in the household and if they had attended school at any time during the last year, what ethnicity the people in the household were and if the family income was over or under $1,000 for the period. “…in Boston the probability of school attendance was positively related to a ward’s wealth and negatively related to its proportion of Irish residents, but in Chicago the reverse was true.” p. 270-271. In other words, if you were a poor, Irish male child in Chicago in 1860, you had a better chance of attending school than a child of similar wealth and ethnicity in Boston. The rest of Galenson’s study attempted to explain why this difference existed. He found that there was no Catholic School System in Boston, so the public schools in Boston were pretty much the only game in town – “…more than 85 percent of all children who attended school in Boston in 1855 and 1860 went to public schools.” p. 271 In other words, the public schools had a monopoly on the market. Unless you were wealthy, your children had only one choice – the public school. Why would it make such a difference on school attendance if a child had the choice to attend a public or a Catholic school? Galenson found the answer in a condition that differed in each city. Boston had a public system that went back to 1635 while Chicago’s “…basis for a city school system was first established by an act of the Illinois legislature in 1837….” p. 283. 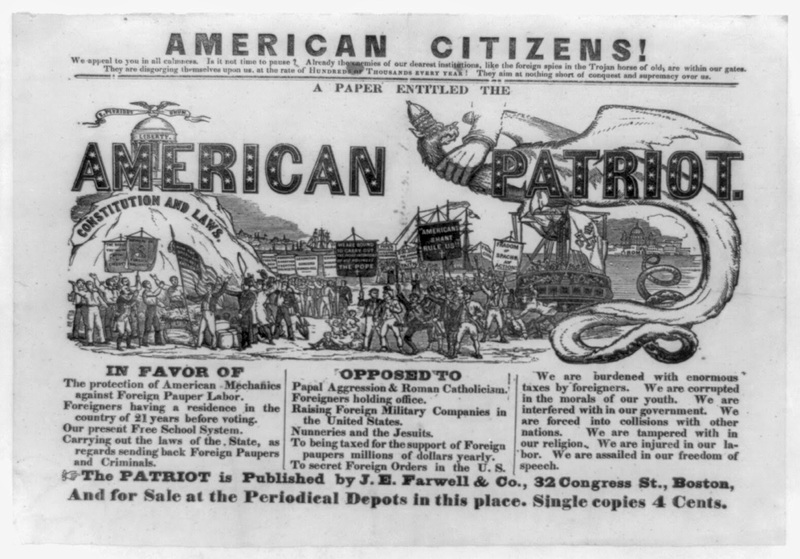 Along with the much longer history of its public education system, Boston had more nativist sentiment among the administrators who ran the schools and the teachers who interacted with the students. American citizens! We appeal to you in all calmness. Is it not time to pause? . . .
“In contrast to Boston, Chicago’s early public school system may have also had a different attitude toward immigrants. Chicago’s population was very heterogeneous from its earliest days, as the foreign-born made up 30 percent of its population in 1843 and more than 50 percent in 1850.” p. 284. So what conclusion did Dr. Galenson make as to why Irish boys in 1860 Chicago attended school in greater numbers than their cohorts in Boston? Irish children in 1860 Chicago had the choice of attending a Catholic School where their ethnicity, social class and religion were respected. On the other hand, Irish school-age boys in 1860 Boston had only one choice of school -- the public school, where they encountered discrimination due to their poverty, their Irishness, and their Catholicism. I learned an incredible amount of history from this academic study – history, economic, sociology, education, immigration – all covered in this article whose author was comparing school attendance of Irish immigrant sons in 1860 Boston and Chicago. And only in JSTOR did I find this resource.